Facebook sure has come a long way from its humble beginnings as a simple college-student-only networking site! Now, there are more than 60 million active Facebook business pages on the social media giant and more than 2 billion monthly active users! What does this mean for you as a real estate agent? Not only are your leads on Facebook, but if you give them what they want, they are willing to show their support! So, what do leads want? Above all else, they want content that appeals to and engages them, evoking either a sense of urgency, educates them or spurs emotion of some kind. You must either educate or entertain them and provide a brand presence so that they are happy to get behind you. 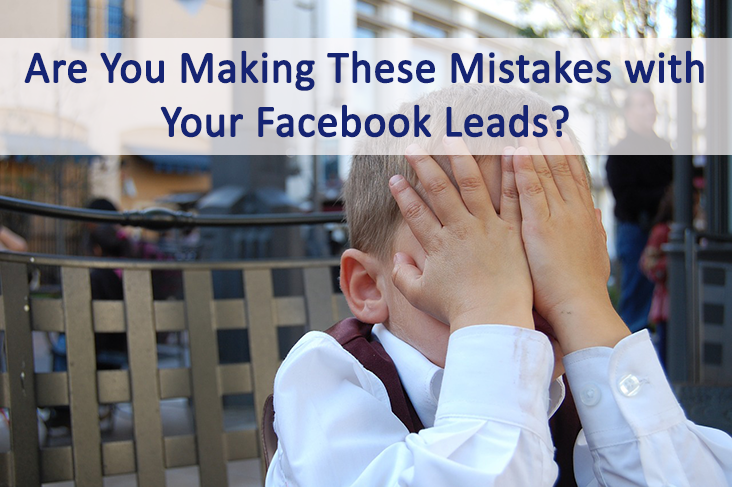 Check out the 6 mistakes you could be making with your Facebook real estate leads! If you are making any of these 6 mistakes, however, it’s very likely you aren’t seeing any (or all) of the benefits you can reap from using Facebook for your real estate business. How can you expect to convert Facebook leads if you don’t have a way to contact them other than through Facebook? Sure, Facebook is a great tool for nurturing, but you can’t learn a lead’s preferences or reach out for a phone call without further contact info. Pushing traffic to your website from Facebook is as easy as posting blogs, listings, and your website along with your other engaging content. Give fans a reason to head to your site! With lead capture installed there, you now have the chance to get their information and with your website traffic tracking, you can gain valuable insight into what your leads like! While on the topic of pushing traffic to your website, this can be truly unhelpful if you don’t have a lead capture form in place. Your website should be a combination of gated and ungated content, meaning certain areas can be accessed without filling out information, but others should be protected with a lead capture form. It’s not enough to simply create a few mindless Facebook posts and hope for the best, you must have an element of strategy to be successful. Put yourself in the shoes of a buyer or seller lead, what are they looking for? Likely information on the process and proof that you are the agent to go with. This is where Facebook can come in handy. Nurture your leads with educational, entertaining, or emotionally-charged content to get the very most engagement from your leads. The timeline for closing a deal most often isn’t overnight. While it’s easy to get impatient, you never know what action leads will ultimately take. You may have qualified leads who end up deciding not to buy or sell or you could have leads that take 2 years, but will eventually convert! It pays to take time, nurture leads who are higher up the funnel and be patient! Treat your Facebook leads like any other! You wouldn’t speak once to a lead, hear they aren’t ready just yet and then abandon them altogether, would you? Follow-up with those Facebook leads. Through your social media connection, you have a more natural avenue to continue engaging these leads than any other type. Be sure to respond to questions, thank people for shares, and form a relationship that isn’t pushy, but is helpful and beneficial to the lead. When/if they are ready and you continue down this path, you’ll see that your Facebook leads are converting much better than when you simply neglect them. While the majority of us have personal Facebook pages, there are agents out there who simply don’t have a Facebook page. If that’s you, don’t worry, perhaps this is the easiest of all on the list to fix! Don’t have time for Facebook? The good news is that we DO and we'll help you form a winning strategy! Find out more about our automated social posting and other offerings by signing up for a demo today!